Lentils. Tiny powerhouses of nutrition. A colorful, protein-rich, fiber-fabulous one-pot meal. Full of iron and B vitamins. Linked to sharper mental focus, less fatigue and better memory. Topped with a fried, runny, yolky, nutrient-dense egg. I’m totally in. I’ve turned to this recipe time and time again on busy days. Sometimes I use red lentils, sometimes green, both found in the bulk section of the grocery store. Reds finish with a sweeter taste and cook up faster. They are more mushy but in a comforting-kind-of-mushy way. French greens are more robust, retain their shape better, and have more of an earthy flavor. When the lentils are finished, put a few scoops into a bowl. Top with an egg fried in ghee or butter, a few leaves of arugula or mixed greens, a drizzle of balsamic vinegar, a pinch of salt and pepper, and an optional sprinkle of freshly grated Parmigiano-Reggiano cheese. You have an awesome weeknight meal. #RealFood #HealthyCookingForBusyPeople. 1. In a saucepan, heat 2 tablespoons (or a 3 second pour: glug, glug, glug ) of olive oil. 2. Add the carrot, onion and garlic and cook, stirring, until the vegetables are softened about 7-8 minutes. 3. Add the tomato paste and stir over medium heat until shiny and toasty about 1 minute. 4. Add the lentils and 2 1/2 cups of broth and bring to a boil. 5. Simmer over low heat, stirring occasionally, until most of the broth has been absorbed, about 25 minutes. 6. Add the remainder of the broth and simmer until absorbed and lentils look creamy, about 10-15 minutes. 1. In a skillet heat up the ghee or butter over medium heat. 2. Crack the eggs into the skillet, season with salt, and cook over medium heat until the edges are golden, the whites are just set, and the yolks are still runny. 1. 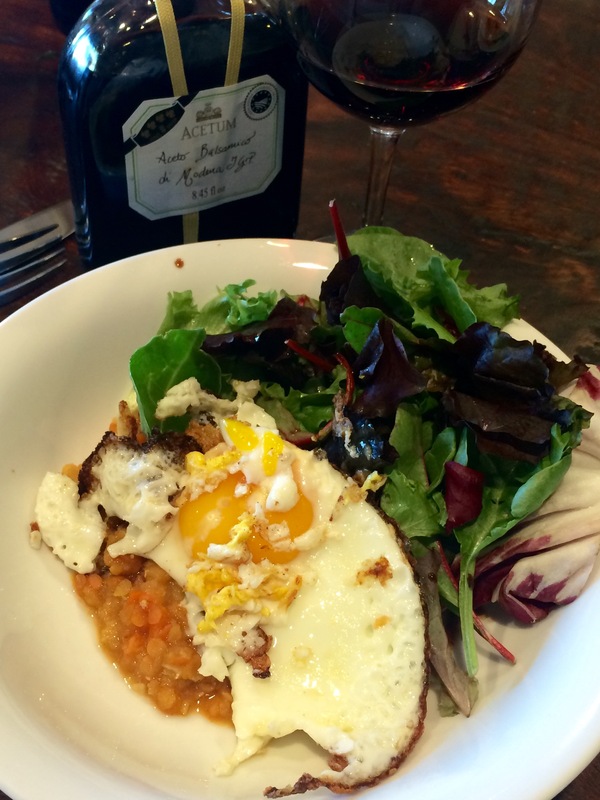 Spoon the lentils into bowls and top with eggs and arugula (or mixed greens). 2. Drizzle with balsamic vinegar and sprinkle with cheese if using. 1. Chop the onion, garlic, and carrot in a food processor to save time. 2. Did you know they sell tomato paste in a tube? I love this! You don’t have to waste a can when you only want a a few teaspoons. I use the 365 brand from Whole Foods. 3. Heat pan before you add in the olive oil. The oil will heat more quickly. (This may also prevent the oil from burning — if you’re like me, I put the oil in the pan, turn on the heat, get distracted doing something else, then turn around to see smoke rising from the pan. Once olive oil smokes it’s unsafe to use and you need to start over). 4. I suggest treating yourself to pasture-raised, organic eggs. They are are little more expensive but 1) the egg yolk from a pasture-raised egg is richer tasting and more delicious than a free-range egg 2) reports have found that pasture-raised eggs are higher in vitamin A, E and D, omega 3 fatty acids, and beta carotene than other eggs. Let me know if you have questions or need more details.